If you have ever moved before, you know how stressful it can be. If this is your first time, hold onto your hat! Many people who are moving consider a DIY move – renting a truck and depending on family and friends to help them out. Unfortunately, these moves don’t always work out the way you plan. Things come up and friends need to cancel, leaving you short-handed. It is also not uncommon for valuable and sentimental items to get broken or lost in a DIY move. We have built a solid reputation for being the movers Bethesda, Maryland residents turn to for local moves. We can provide a moving team to efficiently move you into your new home, no matter what type of residence you are moving into. We provide all moving materials, shrink-wrap all your large items and provide quilted padding to fully protect your property as we transport it to the new location. Interstate moves can be extremely stressful and require top-notch coordination and planning. Our Bethesda, MD team of movers partner with multiple moving companies around the country so you can be assured that no matter what company is handling your move, we have fully vetted them out and that you are still in good hands. Maybe you have redecorated, built an addition, or just decided to switch things up a bit. 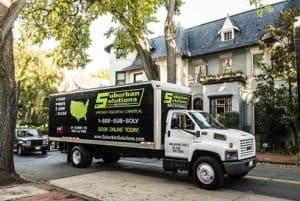 Whatever the reason, you can count on Suburban Solutions for any in-house moving of furniture, appliance, or other belongings that you need to be done. We are also available to move furniture in for staging if you have listed your home for sale or to remove unwanted items. If your company is moving to a new location, turn to Suburban Solutions to help coordinate what can often be a massive undertaking. We will send a member of our moving team to take a complete inventory of all the items that will be moved, as well as determine how these items will be removed for the building, including door widths, elevator access, and other factors which could hamper a smooth move. We will do the same evaluation at the location to which you are moving. Many people do not have the time to pack up all their items because of all the other details they need to address when moving. Our dedicated and experienced movers from our Bethesda, MD location can take care of this too. We will pack all your items to make sure they arrive safely and in one piece to your new location. We also provide all packing materials, including boxes, packing paper, and packing tape. Contact the movers that Bethesda, MD residents trust for a stress-free move, Suburban Solutions, discuss details of your move and to obtain a no-obligation estimate.